Email forwarding lets you share email that you have received with others. Manual forwarding – Done by a person using an Email Client. Automatic forwarding – Done by Email Server or client message rule. The two forwarding types represent two quite separate uses. In this tutorial we will cover manual email forwarding. Does the original sender see it when I forward it? What happens to email attachments?Are they forwarded? So in addition to showing you how to forward messages in Yahoo and Gmail we will also answer these and additional questions. Manual forwarding is done on a per message basis, and is done by the person receiving the email. The main purpose is to share the email with others. Forwarding is possible with all email clients both desktop and web based. Add additional attachments or remove existing ones. Add a message and or modify the exiting message. To forward an email in Yahoo mail open the message, and use the three icons at the top of the message or the links at the bottom. Click forward and the forwarding message template opens for you to edit. It is normal to leave the subject field unchanged. Enter the recipient address in the to field. You can cc or bcc the message just as you can with any other message. The message body consists of the original message including the message header from the original email. 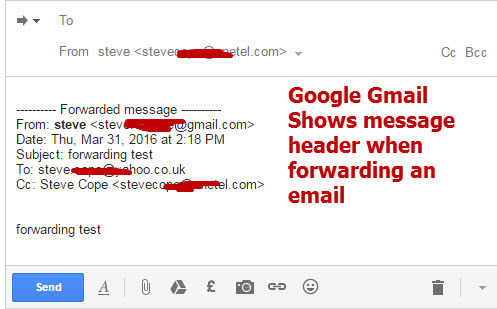 The Screen shot below shows the Forwarding message template when you forward an email in Gmail. Notice that Gmail includes the complete message header in the message body, and doesn’t display the subject by default. You can edit the subject by clicking the drop down arrow next to the To field. 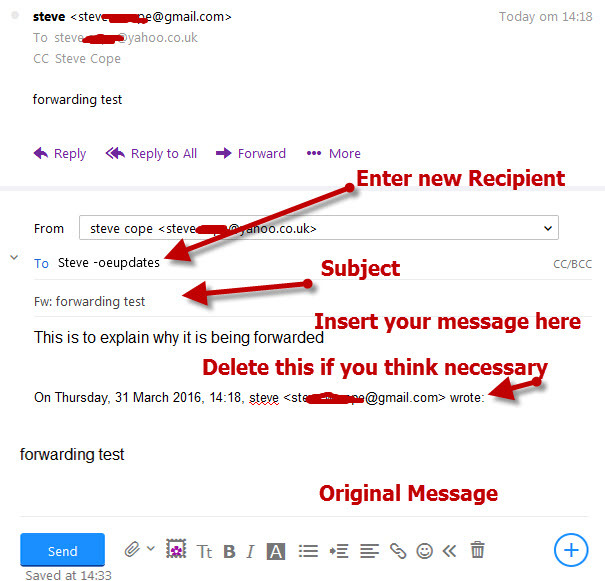 There are pros and cons of leaving or removing the from address (original sender) from the forwarded message. If you leave it then the recipient knows the email address of the original sender. This may or not be a privacy issue. The recipient knows who sent the original message, and so it shouldn’t get forwarded back to them in a loop. You should normally always remove the cc addresses if they are included. You should always add your own message to explain why you are forwarding the message, and what you expect the recipient to do (if anything). 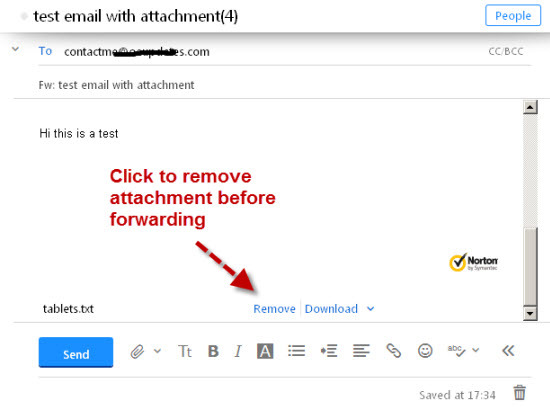 When you forward an email any attachments are normally forwarded by default. Most clients allow you to remove them before forwarding. You can also add new attachments if needed. If the recipient replies to the forwarded email then the reply goes to the person who forwarded the email, and not the original sender. If you want to reply to the original sender then you will need to get the email address of the original send from the message body. A- Yes they all support email forwarding. This is Automatic email forwarding as it is done by the email server and not the email client. Q- When I forward email is it also sent to the original sender? Q- When I forward email does the original sender know I’ve done it? Does he see it? A- Yes this can happen and so you should be careful. The most likely cause is that most people use conversations, and you may need to disable this. See this Gmail forum response and this Yahoo response. Q- What Happens to the Original Email When I Forward? A- When email is forwarded, a copy of the email is sent, and the original email is retained.